Do you feel the best you have ever felt in your life? If the answer is “No!” Now, is the time to get off that sofa or out of that mental mind block and commit to improving your health and life once and for all while YOU CAN. If you answered yes to any of these questions, you will benefit from the class I am offering. You may choose one on one sessions with me privately or begin a Group Class. 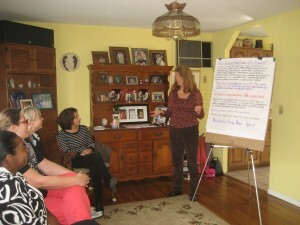 We will meet every 2 weeks at my home, 32 Woodfield Dr. Shelton, CT or yours with a schedule that works for both of us. The program will include 7 one hour sessions which you can continue if you choose to. I also do workshops at schools and libraries. I am offering a scientifically based program for rebalancing insulin and blood sugar levels that I learned from Dr. Mark Hyman. Dr. Hyman was co-medical director of Canyon Ranch for almost ten years and is now the chairman of the Institute for Functional Medicine and founder and medical director of the UltraWellness Center. He is the New York Times best selling author of Ultra Metabolism, the UltraMind Solution and several other best selling books. He was also one of my teachers at the Institute for Integrative Nutrition. The next ebook he is writing will include one of my recipes and my website. I am honored to have my recipe included in one of his books. Instead of going on a diet, how about learning how to eat healthier for a lifetime! Diets Don’t Work! They have a beginning and an end. You say, “I’m going to lose weight to fit into this prom dress, or so I look great at someone’s wedding, or so I can wear a bathing suit for my vacation”. Then what? I have put on a few pounds over the holiday season myself. We are going to get back on track together! We will meet weekly in my home (32 Woodfield Dr. Shelton, CT 06484). Or you can get a group together(3 or mor people) and I will come to your home or office. YOU WILL BE EATING REAL FOOD, NOT DIET FOOD! Balance in Your Life and your family. Healthy relationships, a fulfilling career, regular physical activity and a spiritual practice are essential forms of nourishment. When these “Primary Foods” are balanced, what you eat becomes secondary. Are you ready to begin YOUR ‘METAMORPHOSIS ~ Body, Mind and Spirit’? I have lost more than 60 pounds and kept it off for almost 20 years. I am managing my Hashimoto’s disease (auto-immune disease) and I feel better than I did when I was in my 30s. I am in my 50s and I feel vibrant! I will accompany you on your journey to transformation. Through my highly energetic and motivational style, I support my clients and their families on their journey to health, confidence and happiness. I work with stressed out people that are overwhelmed by destructive habits of insecurity-habits that generate anxiety, stress and mindless eating. I work with families that are struggling with weight and many with auto-immune diseases. I will help you with eye opening strategies that are effective and healthy alternatives. Time to clean out your kitchen? Improve you and your family’s health? Your journey to health, confidence and happiness can start NOW with looking at your lifestyle, learning to read nutrition labels, cooking healthy meals, choosing healthier take-out meals, reducing sugar cravings-even with your busy schedule! Don’t let the scale make or break your day. Weigh in is totally optional. I have it available but you are not required to step on it. debbiebarbiero@yahoo.com debbie@metamorphosisbodymindspirit.com or call 203-929-9414 to register. If you have a gluten intolerance or other special dietary needs, I have some meal ideas for you too! We have turned the pages to a new year. A new year means a fresh start, a new beginning. Every day is an opportunity to start over. I am here to help you. When we are not together for a session you can email me for support. I am here for you.